Indeed, the rapid pace of social media has brought top teams to switch up racing liveries not just season-by-season, but up to the point of event-by-event. The most dramatic I can think of is Alec Hohnadell’s Formula Drift car last year, that got a new full-car vinyl wrap every round of the season. But it is the month-by-month schemes of supermarket giant The Kroger Co. sponsoring Chris Buescher in this year’s Chris Buescher NASCAR Monster Energy NASCAR Cup Series that most catch my eye. 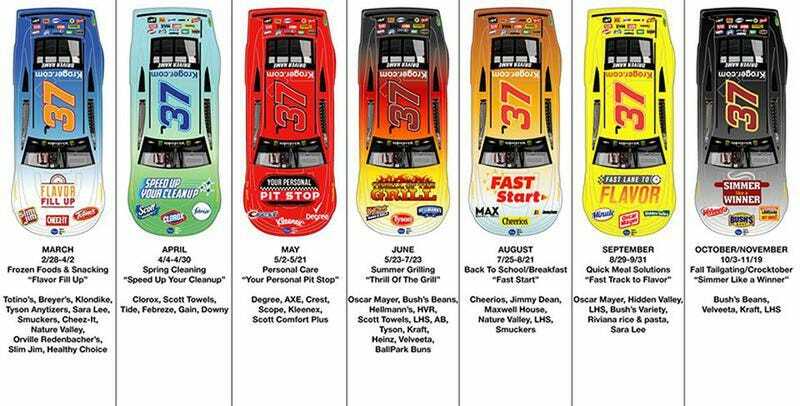 In previous seasons, the team had numerous brands that rotated on the hood from race to race, making it difficult for any particular brand to consistently communicate with the race fans. In 2019, the team will highlight shopper themes throughout the season that allow groups of brands to communicate with fans when they are most likely to be focused on specific buying occasions. The unique approach will feature seven themes that will be showcased on the hood for consecutive weeks at a time﻿. Let us revel in “Flavor Fill Up” with Slim Jims. Or let us ride the “Fast Track to Flavor” with Hidden Valley. Or should we rather pause for “Your Personal Pit Stop” with Scott Comfort Plus? Let none of that pay you any mind. CROCKTOBER is where my heart lies. CROCKTOBER is my dream. I will “Simmer Like A Winner” every day of the month, guided by Velveeta, in ecstasy.